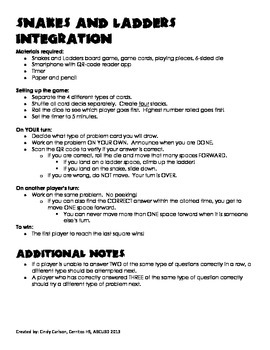 I created a review game, using Snakes and Ladders. A smartphone or mobile device with a QR-code reader is required. 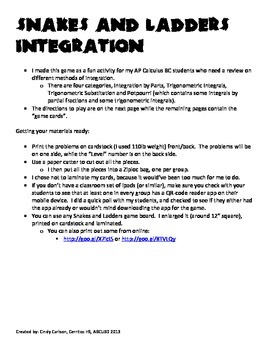 There are 48 integration problems to work on (if you don't like the game). The answers can be obtained by scanning the QR-code. 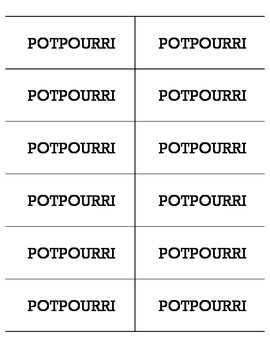 There are 4 categories of problems: Integration by Part, Trig Integrals, Trig Substitution, and Potpourri (which contains some trig integrals and partial fractions. 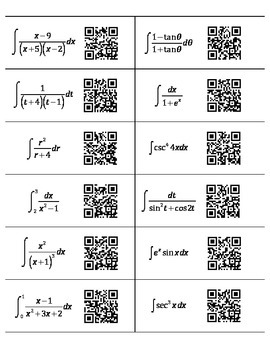 Since I also use this for my own classes, the links from the QR-codes will remain in place. I am in the process of creating more of these for both my Calculus class as well as my Algebra II class.